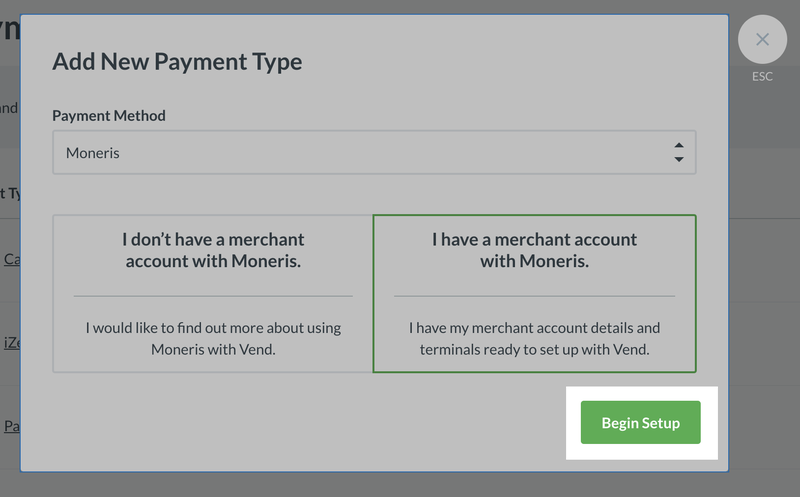 Setting up Moneris Payments with the Vend Register iPad App – How can we help? Moneris payments are an integrated card payment provider. They're fast, secure, and easy to use. Moneris payments run via Ingenico payment terminals. Are available to Canadian retailers. Support Apple Pay and tap payments. Make sure the terminal is connected to power and your network with an Ethernet cable. Make sure that once powered on; the Ethernet logo is green. Make sure your paper roll is loaded correctly. For each of these steps a period can be entered by pressing the '0' key followed by the '#' key and input is saved/confirmed by pressing the green button. Enter ##08 and select COMMS TYPE, select ETHERNET and save the settings with the green button, once you see TCP CONNECTION OK press the red button to get back to the home screen. Print the configuration of the terminal by entering ##16 from the main screen, enter NO when prompted about trailer messages. Take note of the ETHERNET PARAMS section, if it says type is STATIC then skip to the Semi-integrated steps below. Keep this slip for setting up the register later. Enter ##13 then select TERMINAL SETUP, then TERMINAL TYPE and choose STATIC. Select TERMINAL ADDR next and enter the information from Address as printed on your configuration slip. Select MASK ID next and enter the same address as was printed on your configuration slip. Select GATEWAY next and enter the same address as was printed on your configuration slip. Press the red key to step back one menu, then select DNS SETUP. Select PRIM ADDRESS next and enter the information from PRI DNS as printed on your configuration slip. Select SEC ADDRESS next and enter the information from SEC DNS as printed on your configuration slip. Once you are done press the red key until you get back to the main screen, the terminal will now reboot. Enter ##53 from the home screen and make sure RCPTS AT TERM is selected. The screen will show REINITIALISATION REQUIRED. Enter ##52 from the home screen and make sure ETHERNET is selected. Press the red key to get back to the home screen. Enter ##13 then select TERMINAL SETUP, then select PORT NUMBER and enter 9999. Press the red key to get back to the home screen then enter ##01, swipe your administration card and enter YES to retain your merchant settings. If you are asked to input your merchant ID at this point, please consult the documentation you got from Moneris. Once the initialisation is complete, the screen should show 'Welcome/Bonjour'. If you're having trouble with these steps, please contact Moneris on 1-866-319-7450. 1. Click on Setup on the side navigation menu. 3. Click Add Payment Type. 4. 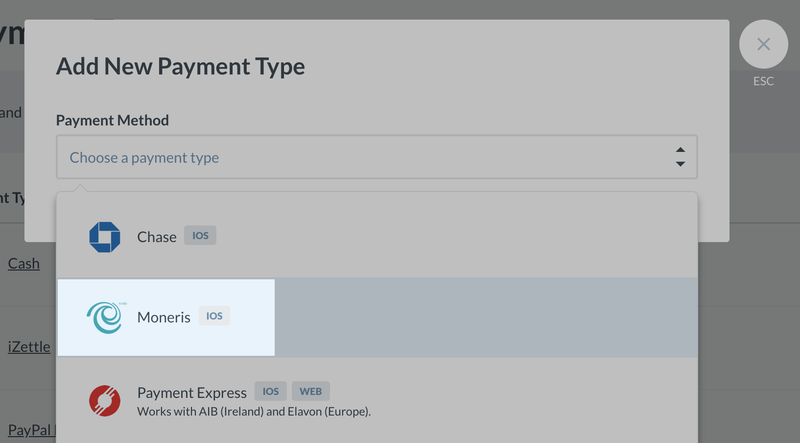 Select Moneris in the Payment Type drop-down. 5. If you have a Moneris account set up, click on Begin Setup to pair your payment terminal. 6. Rename your payment type if you wish, and then follow the steps in the Pair Card Readers section. Open the Vend Register menu on the left-hand side and navigate to the 'Hardware' page. Enter the IP address and port number from the previous steps here. If you're having trouble with connecting the terminal to Vend, contact help@vendhq.com. Repeat the above process for each terminal and register you need to connect. If you want to use a terminal you've already connected with a different register, you'll need to reassign it. Take note the IP address and port number and then remove them from this page. Enter the IP address and port number from the previous step here. Help I'm out of paper! The Ingenico iCT250 terminal takes standard 2.25" (58mm) thermal receipt paper which can be found at your local stationery store. I've lost internet access, can I still run a transaction? The Ingenico iCT250 terminal may be set up with a phone line fail-over if you have a traditional phone line available in your store, please contact Moneris support to verify that this is available and set up on your terminal. The terminal is not set up correctly for integration with Vend; please refer to the setup section above for instructions on how to correct this.